Don’t know what classes to take? Want to know more about your Meta-Major? Trying to find out what you need to graduate? Wondering whether to withdraw from a class? Not sure of what academic or tutoring resources are available on campus? Ask a West Campus Program Advisor. 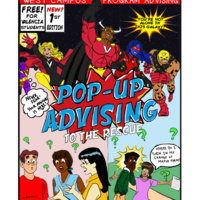 Providing referrals to make a later, more in-depth advising appointment with the Program Advisor for your Meta-Major!